Can a Twelve-Year-Old Use Protein Powder? Kids can use protein powders, and, in fact, many protein supplements are designed specifically for teens and adolescents. However, the risks involved lead to it being a choice you should make with your child's pediatrician. Your 12-year-old most likely gets plenty of protein in his diet, according to the Centers for Disease Control and Prevention, which states most Americans consume more than enough protein on a daily basis. In many cases, protein supplements are just added calories. Additionally, certain protein powder blends contain ingredients not suitable for children, such as creatine, so pay attention to the ingredient list on the product packaging. Never offer your child protein powder without first discussing it with her doctor. Physically active adolescents require more protein compared with sedentary kids of the same age, according to the nonprofit organization Teen's Health. These kids need more protein due to the greater number of calories burned and muscle proteins broken down during training, sports or play. Despite the fact athletes need more protein in their diets, resorting to protein powders usually isn't necessary. Teen's Health recommends sticking to more nutrient-dense sources of protein, including chicken, fish, lean beef, dairy products, whole grains and vegetables. According to the CDC, the average 12-year-old needs about 34 grams of protein in his diet per day. Most kids already consume far more than this amount, even without supplements. For example, a breakfast containing two eggs, a piece of whole wheat toast and a glass of milk contains about 25 grams of protein alone. Physically active adolescents may need additional protein in their diets, but you should talk to your child's physician before increasing intake of protein. Health risks are associated with consuming too much protein. The main risk is weight gain in the form of body fat. When a child consumes more protein than her body can handle, the excess protein is often stored as body fat. That's why it's important to follow the RDA for protein. 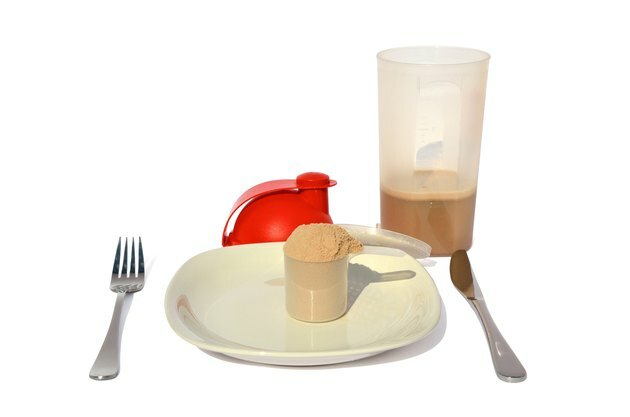 Adding protein powder to the average American child's diet will often exceed the child's daily need for protein. Other risks of consuming too much protein, according to Teen's Health, includes dehydration, calcium loss and kidney problems. Other than causing potential increases in body fat, some protein powders have other safety concerns that make them a bad choice for kids. A 2010 study conducted by "Consumer Reports" tested the toxic heavy metal content of 15 different protein supplements. It found that three of the supplements contained unsafe levels of certain heavy metals, including cadmium, arsenic, lead and mercury. Dr. Michael Harbut, MD, of the Karmanos Cancer Institute states that these elements are particularly harmful to children and pregnant women. Toxic heavy metals can damage organs, including the kidneys. Is Whey Protein Powder Bad for Toddlers?